Banking and financial services have traditionally been a heavily regulated industry where technology alone has not been a sufficient factor to transform the operating architectures of the industry. The pervasive view in the financial industry has been that digitalization and its integrational development will take place on the platforms of the banks. 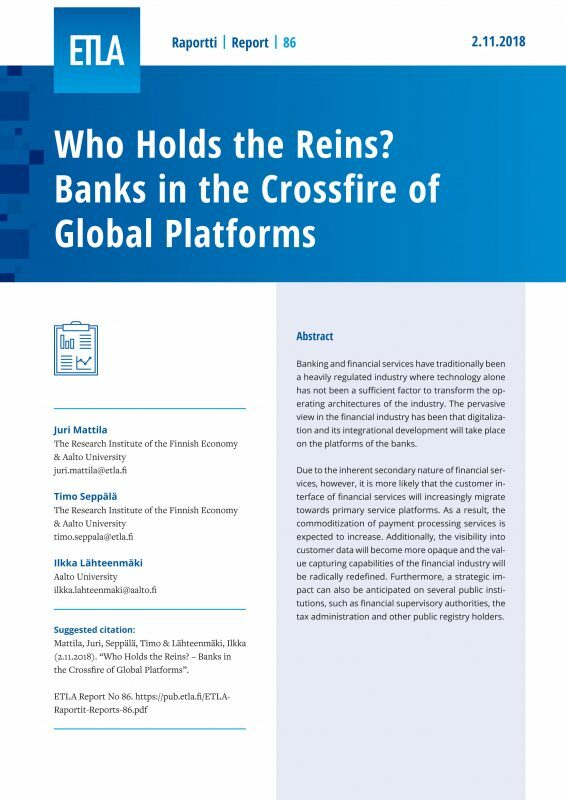 Due to the inherent secondary nature of financial services, however, it is more likely that the customer interface of financial services will increasingly migrate towards primary service platforms. As a result, the commoditization of payment processing services is expected to increase. Additionally, the visibility into customer data will become more opaque and the value capturing capabilities of the financial industry will be radically redefined. Furthermore, a strategic impact can also be anticipated on several public institutions, such as financial supervisory authorities, the tax administration and other public registry holders.